Most of us don’t really relish the thought of working overtime, but we’re willing to put in the hours when the situation calls for it — and increased pay usually helps to offset the disruption. A new law in Hungary, where right-wing officials are advancing an extremely conservative agenda, puts quite the spin on overtime — and protesters are calling it a “slave law” as they take to the streets. The law, technically an amendment to an existing labor law, would allow employers to require up to 400 hours of overtime each year — something the ruling party says is necessary to address labor shortages. In addition, employers could take up to three years to calculate and pay out overtime wages, in a setup that could have people working for free. Unions are worried about these developments, but they’re also concerned by a clause that allows employers to bargain directly with workers, bypassing union involvement to make deals that could undermine labor organizing. Prime Minister Viktor Orbán is already extremely popular with the far-right in Europe. Under his control, Hungary has adopted extremely regressive social policies, including an effective ban on homelessness. His government is also highly corrupt, setting up its own court system to bypass accountability, choking off the media and engaging in rampant voter suppression and election manipulation. The situation has become so extreme that the European Union is threatening legal sanctions. This latest development, though, may be a bridge too far. After the law was forced through – thanks to the two-thirds majority held by Fidesz, Orbán’s party, which won only 49 percent of the vote – widespread protest broke out. Thousands of people have been taking to the streets night after night, despite cold temperatures and a hostile reception from law enforcement. A group of opposition members of parliament staged a protest in parliament, in addition to storming a broadcaster in an attempt to get a list of demands — including one to rescind this amendment – read on air. On its own, this amendment would be horrific enough, making it easy for Hungarian companies to exploit workers and putting them in a position where they can’t fight back. Weakening the role of unions is particularly critical, and a common tactic in authoritarian regimes. But the “slave law” is actually happening in the context of a larger series of “reforms” driven by Orbán’s party that are much more worrying — as they suggest the rule of law, and human rights, may be breaking down in Hungary. 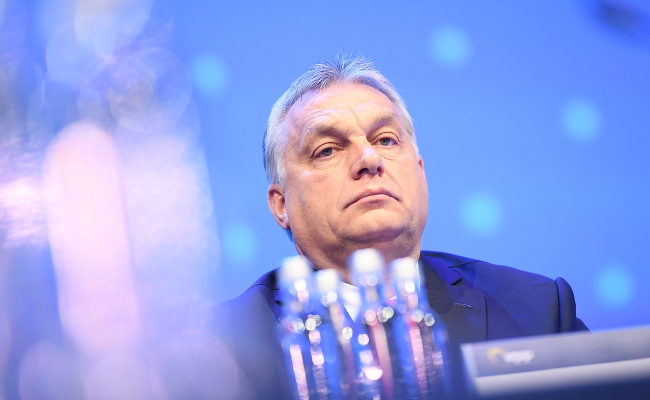 The EU’s decision to explore legal options for addressing the rise of policies driven by hateful right-wing sentiment in Hungary is extremely unusual. While numerous member nations have tolerated and sometimes even encouraged the rise of repressive right-wing ideology, Hungary’s decision to mainstream it into the very fabric of government makes it challenging for the EU to ignore. The “slave law” will add ammunition to the argument that the nation clearly needs to be put in check in the interest of protecting human rights; without fair elections, unbiased courts and freedom of speech, Hungarians may find it challenging to assert their rights and autonomy. As opposition lawmakers struggle with feelings of powerlessness and Hungarian citizens facing a cold winter and a repressive government feel more restless, the nation could be headed for an explosive conflict. Those concerned more broadly about the rise of authoritarian governments worldwide may want to take note of what brought Hungary to the breaking point, as well as what happens next. This is outrageous, I hope their protests are successful. This near-slavery is a human rights violation and needs to stop. This is a disgusting development in Hungry but it is just the natural development of the neo liberal ideology espoused by Reagan and Thatcher.